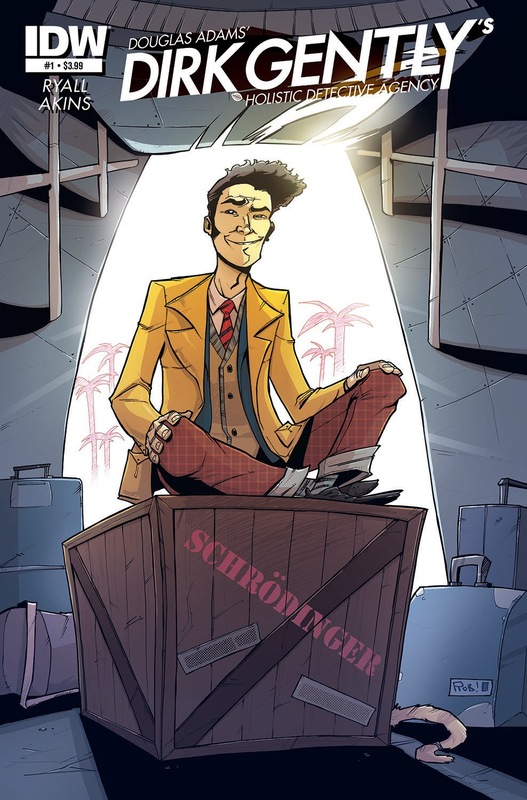 In partnership with Ideate Media, IDW Publishing is proud to announce that Dirk Gently will be appearing in his first-ever comic-book series in 2015, helping to prove the interconnectedness of all things, the precept by which Dirk Gently, Douglas Adams’ beloved fictional “holistic detective” lives. Following the recent announcement that Gently will be developed for television by IDW Entertainment and Ideate Media with Circle of Confusion as Executive Producers and Max Landis as showrunner, IDW will also launch an ongoing series of all-new Dirk Gently adventures as comic books. The series launching in spring 2015, will be written by Chris Ryall, IDW’s Chief Creative Officer/Editor-in-Chief and creator/writer of series such as Zombies vs Robots, Groom Lake, and The Hollows. The series artist will be Tony Akins (Fables), and Chew co-creator Rob Guillory has contributed a first cover image, too. Full story details and release information will follow soon. "Douglas was best known for Hitchhiker, but his real creative passion was always Dirk. Of the two series, this was his secret favourite. I know he would have smiled upon its re-incarnation as a comic book,” saidEd Victor, Douglas Adams’ longtime agent and friend. Adams’ Dirk Gently, who appeared in Dirk Gently’s Holistic Detective Agency, Dirk Gently’s Long, Dark Tea-time of the Soul, and the unfinished Dirk Gently fragment that Douglas was writing at the time of his death The Salmon of Doubt, is a charismatic, mysterious, troubled, brilliant, figure—cursed with a relentless intellect, psychic powers he doesn’t fully understand or want, a gift for self-mythologizing, and a supernatural ability to detect disturbances in the fabric of reality. Dirk has found a strange calling as a private detective for impossible crimes, the likes of which will take many forms in the comics. Follow IDW Publishing on Facebook and Twitter for updates on this title and more. If you’d like to fundamentally interconnect with Chris Ryall on Twitter, he can be found at @chris_ryall.